When traveling around in your RV, you need to make sure that your belongings are safe within your mobile home. Unfortunately, if you weren’t aware before, you should know that the standard lock on your RV door is the same as every other motorhome on the lot. To expedite things for RV dealerships, most manufacturers use the same lock for all of the doors and storage compartments. Unfortunately, that means that anyone with the right key can get in without any issues. Thankfully, installing a new RV door lock is not too complicated, so you can be sure that your stuff will stay nice and secure while you’re out on the road. Today we’re going to be looking at the best locks and what they offer. If you like the idea of keyless entry, then you will love this handle from RVLock. This is probably the most reliable and advanced option on the market, so let’s take a look at how it can make RV life that much easier. Although having a keypad on your door is convenient, having a FOB is so much better. This way, all you have to do is press the button on your keychain, and you’ll be able to lock and unlock the door remotely. Even with fancy technology, a lock is only as good as its materials. Fortunately, this particular model is made of heavy-duty steel and comes with a powder coating so that it can withstand almost any weather conditions as well. Keyless entry with a FOB is probably the best way to lock up your RV since you never have to worry about forgetting the combination. That being said, this is easily the most reliable option on this list, so even if you’re not super into the convenience, it’s still a remarkably good lock. Although most RV door locks are the same size, this particular model may not fit correctly. I would highly recommend sizing it before you buy so that you don’t run into the frustration of a lock that won’t install properly. When choosing the best RV door lock, you can either go with something that uses keys, or a model that allows keyless entry. For the most part, the latter option is going to be the most convenient, which is why we have this model from AP products. Let’s see what it can do. Although this lock doesn’t come with a full-size number pad, it’s easy enough to program a four-digit PIN into it. Thus, if you don’t want to have to fumble with keys when coming and going, you will appreciate the simplicity of this setup. Because it’s so easy to program, you can upgrade your locks on a regular basis. If security is a primary concern for you, then you may want to change the PIN often to ward off thieves. Although a programmable keypad is useful for most situations, one fear that many people have (myself included) is that the batteries may die, leaving us locked out of our own mobile home. If that does happen, you can still use the keys provided to open the door. I highly recommend using a hide-a-key system if possible. Keyless entry for your mobile home is an excellent way to go, as it is both convenient and secure. I like how easy it is to program this particular lock, and I appreciate the fact that you also have regular keys in case the system doesn’t work for whatever reason. As with any technology, this locking mechanism can be prone to malfunctions. In some cases, you may wind up having to use the keys exclusively because the keypad won’t do anything, even after changing the batteries. Next, we have another keyless entry door lock, although this one utilizes some additional smart sensor technology to make it a little more useful overall. It still doesn’t have a FOB, but in some cases, that may be the best option for you. When I’m talking about intelligent buttons, I’m not referring to anything super high-tech like fingerprint scanners. However, there are proximity sensors on these buttons so that it knows when you’re trying to input the code, and will light up accordingly. When trying to enter your RV at night, having the buttons illuminate is a welcome feature, and will make sure that you don’t accidentally enter the wrong code. Although most people’s fear is getting locked out of their RV, this unit not only comes with keys just in case, but it will show you when the battery is starting to get low. It also has an audible alarm so that you’re sure to swap the batteries when it’s time. Overall, if you’re looking for a simple and effective RV lock that makes it convenient to get into your mobile home, this is an excellent choice. As with the other keyless lock from AP Products, this model can be prone to malfunction. It seems to happen rarely, but if it does occur, you’ll want to replace the whole thing as soon as possible. Four our final RV door lock, we have one that just uses keys. While keyless entry is super convenient, I don’t usually recommend it for people who travel by motorhome sparingly, since the batteries will likely die by the time you need to use it again. Thus, if you’re a seasonal RV user, I would suggest buying something like this lock instead. It doesn’t come with any fancy features, but it works well in all conditions. One element that sets this lock apart from most others is that it comes with a deadbolt. Thus, if you want an extra feeling of security for your door, this is an excellent model to buy. You can get it without the deadbolt if you like, but why would you do that? When buying a new RV door lock, you need to make sure that it will be compatible with your current mobile home. Fortunately, this one fits almost all standard size models, so it shouldn’t be an issue. As far as simple keyed locks go, this is one of the more reliable options. I like that it comes with a deadbolt and that it’s effortless to install. Because there isn’t any technology to worry about, this lock has almost no downsides. The only con I can imagine is if it doesn’t fit your RV door. Also, it’s not as sturdy as some of the other heavy-duty options out there. Do you want all new locks with tons of keys, or do you want the locks keyed the same? Realistically, the fewer keys you need, the better. I would suggest that you buy the same lock for all of your doors and storage compartments so that a single key can open everything. You can usually get the locks coded to one key to make things more convenient for you overall. What type of locks are you going to use? I typically recommend keyless models, unless you rarely head out in your RV. If you’re a seasonal weekend warrior, a manual lock is usually going to be the better choice because then you don’t have to worry about dead batteries or weather-damaged technology. 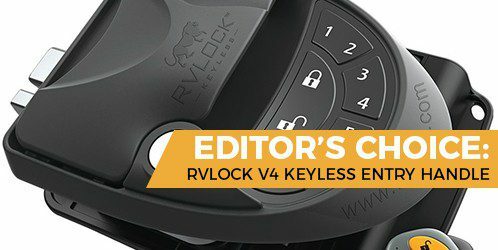 Because I like convenience more than anything, I will say that the RVLock V4 Keyless Lock is going to be the best bet for your travels. That being said, if you only take your motorhome out on the road for a couple of weeks out of the year, you may decide that a manual lock is the best bet. I prefer the V4 model because it’s both well-made and comes with a keyless FOB. I like being able to lock and unlock my RV the same way I do with my car, and it makes getting in and out so much more efficient. I think you’ll agree.